About - Think on..truth, honesty, just, pure, lovely, praiseworthy.. Think on..truth, honesty, just, pure, lovely, praiseworthy..
Ginger Lee Bull grew up in the San Joaquin Valley in California where the countryside comes alive with color in the spring. 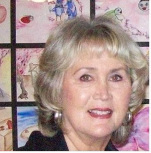 Her love of watercolor expanded into writing and illustrating three children's books in 2005 - Ginger Lady Bug's Adventures Series includes, The Stream, Morro Bay by the Sea, and The Blossom Trail. Imagination has always been her best friend and she encourages young minds to become all they were created to be in watching the world around them and looking for the beautiful things of life.